4x4 Direct Pty Ltd offers a wide range of quality 4x4 Accessories. Based in Vredenburg. We also supply solar and boating products. 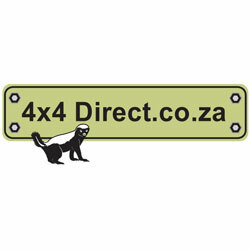 Visit our web site at www.4x4direct.co.za for our online catalog. Battery Pro Vredenburg - We sell all Maxim automotive, truck, leisure and deep cycle batteries. Bike batteries also in stock. Back-up inverters in store as well. Bolt Fast - Vir alle boutjies, moerties, washers, ens. Brendon's Motorherstelwerke - Diens van alle Petrol en Diesel voertuie. Algemene herstelwerk. Remme, koppelaars en padvaardigheid. CFG Fitment Centre - Hoofstraat 77, Vredenburg. Fitment of tyres, shocks and offroad accessories. Mortimer Toyota Vredenburg - Toyota Dealers in Vredenburg. For sales and service. STAR Nissan Weskus - We offer country wide delivery on ALL our New Nissan and Valid Value Pre-Owned vehicles together with the best after sales services to satisfy ALL your motoring needs. Trailer Hire and Sales - Rudi Brits trailer Hire and Sales. Anything from small trailers to a 3m 6 ton lowbed trailer. Contact us on 082-322-7575. TransMoTec - Industrial Sandblasting. Remove old paint qnd corrosion effectively on construction, marine, farming equipment, trucks, trailers or any other steel items.